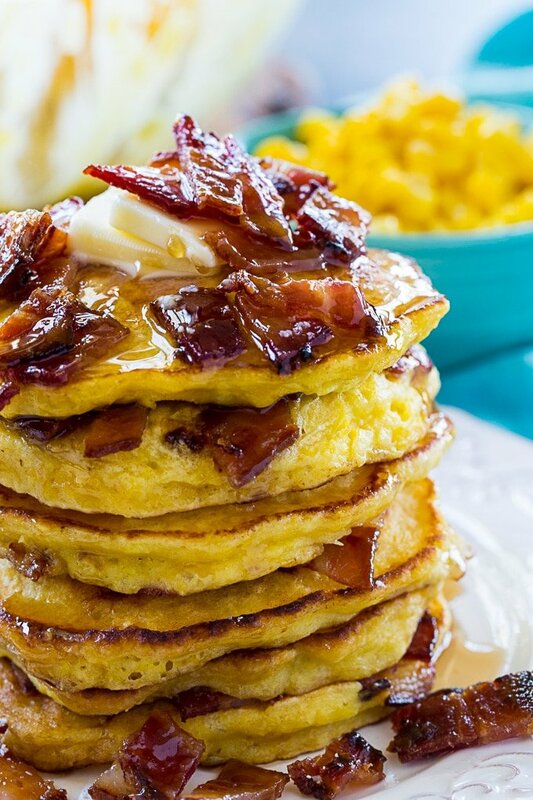 Sweet Corn and Candied Bacon Pancakes are the ultimate southern pancakes. The corn gives the pancakes tons of sweetness and the bacon adds a salty, savory note. 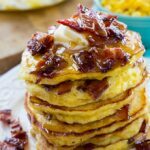 Slather them with butter and drizzle with maple syrup and get ready to dig into one of the most delicious stacks of pancakes ever. Corn and bacon are such a great combination and this isn’t just any bacon. It’s candied bacon with a wonderful sweet and salty flavor. A can of corn gets added to the batter, but it is first pureed with an immersion blender until smooth. This way you get the flavor of the corn throughout the batter, but the batter is nice and smooth. If you don’t have an immersion blender, you can use a food processor or regular blender. 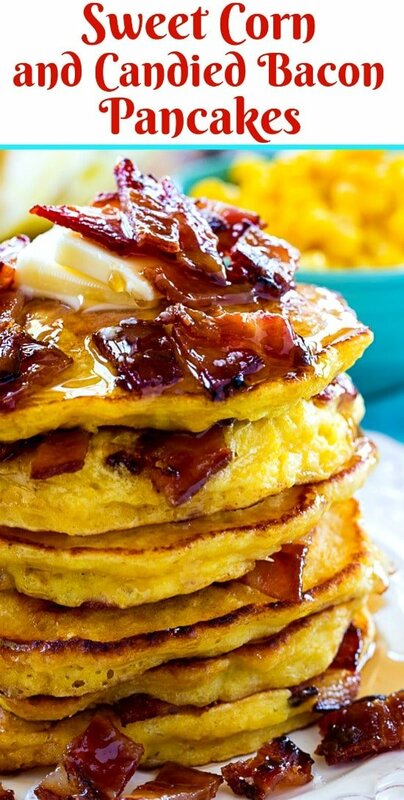 These unique southern pancakes have plenty of sweetness and lots of salty bacon flavor. They are perfect for a weekend breakfast or holiday brunch. 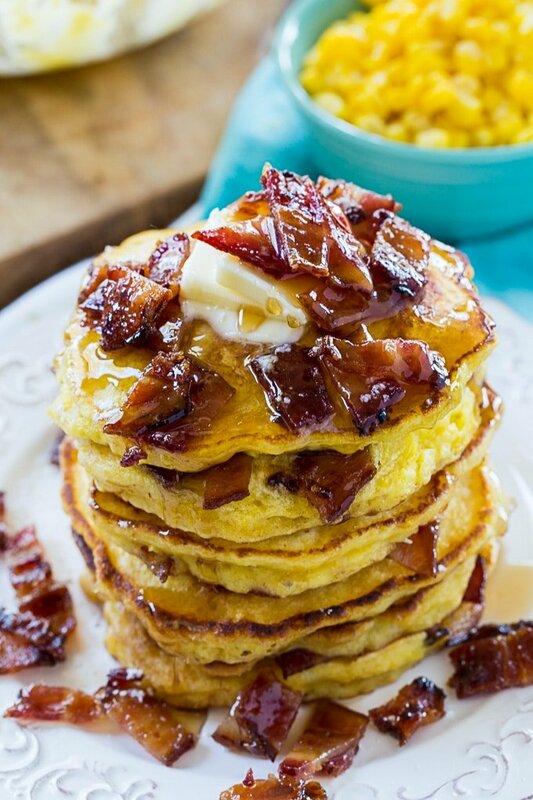 Top them with butter and drizzle them with maple syrup and you’ll think you’ve died and gone to heaven. Preheat oven to 350 degrees. Line a baking pan with parchment paper. Lay bacon strips side by side. Sprinkle with brown sugar. Bake until bacon is fully cooked, about 15 to 18 minutes. Let cool and then chop. In a 2-cup glass measuring cup, combine corn, milk, and 1/4 cup sugar. Puree with an immersion blender until smooth. Or you can use a food processor. In a large bowl, whisk together flour, remaining 1/4 cup sugar, baking powder, and salt. Add liquid ingredients to dry and stir just until flour disappears. Place a small amount of butter on a hot griddle. Once melted, pour batter onto griddle, forming 4-inch pancakes. Sprinkle tops with bacon. Flip over once bubbles form and continue to cook until cooked through. 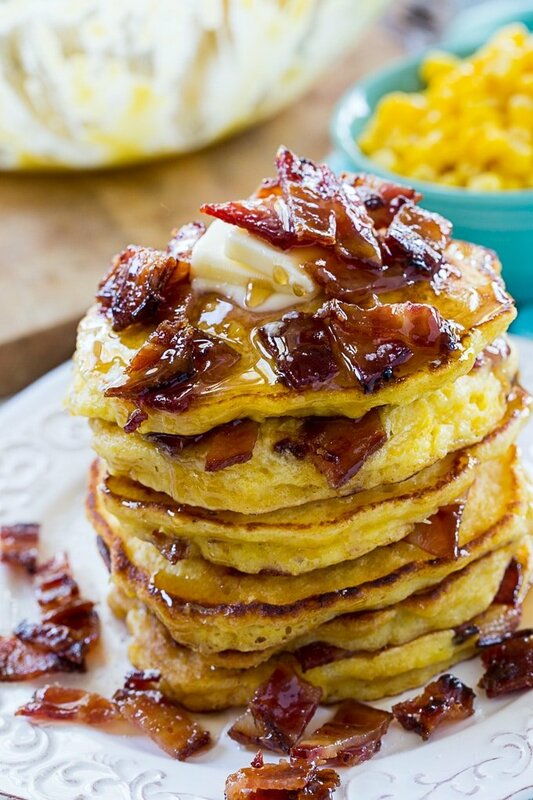 This entry was posted in Breakfast and tagged bacon, corn, pancakes. Bookmark the permalink. Like it , and is different, but I will try it.>>>>>>>EGGS WHERE AND WHEN???????? This sounds great. When do you add the eggs? I will fix that. Thanks!